ISO 22301 is currently working its way through the last step before its anticipated release as an international standard later this year. But what makes this new international standard valuable to organizations of all types and sizes? What makes it different? And, what might it mean for preparedness in years to come? Brian Zawada (MBCI) is a member of the US mirror committee to Technical Comment 223, the group charged with developing 22301 (as well as more than ten other societal security-related standards). 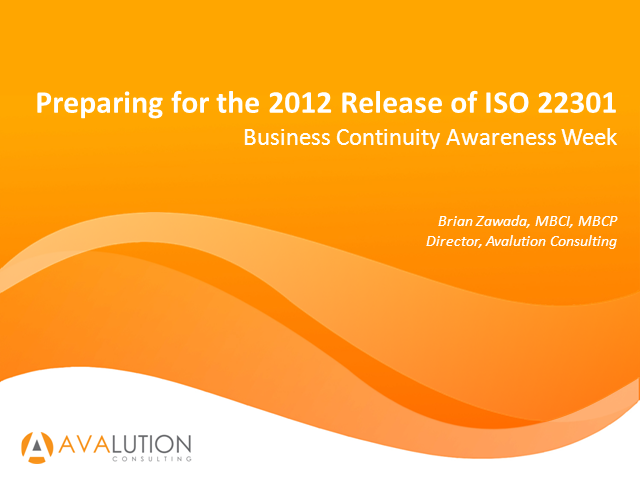 Brian will share his perspectives on ISO 22031 and how he sees organizations using its content in the near future to improve preparedness and better coordinate with business partners, customers and suppliers. Brian will also address a number of the more common questions being posed via social media. Tomorrow's businesses need a simpler and more scalable way to increase the resiliency of global application infrastructure, without slowing innovation, today. This session will show you how architects and developers are making smarter choices in designing secure software. You will also learn how to report success, and investment justification, to the board whilst setting realistic expectations throughout the software development lifecycle and not just at the destination.